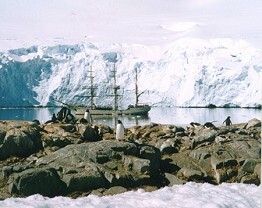 The bark Europa is well known by blue water sailors. 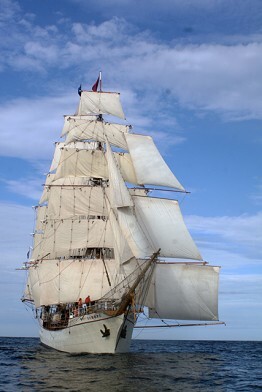 She has sailed in tall ships races in the Atlantic & Pacific oceans, and even in the Great Lakes. This fall & winter she will undertake her third expedition to Antarctica. She has completed the most difficult of deepwater passages, sailing 'round Cape Horn. With 30 sails, including studding sails (one of very few vessels still carrying these traditional clipper ship sails)she hoists virtual clouds of canvas. Built in 1911, she was completely renovated in 1994 in Amsterdam, is flagged in Holland, classified as an Ocean Going Special Purpose Sail Training Vessel, and complies with international safety codes for world-wide deep sea sailing. Below decks her 12 cabins (two 2-berth, six 4-berth and four 6-berth)are complete with ensuite showers and toilets. Your berth is cozy with soft duvet sheets - no sleeping bags required. You will feel at home with a classic wood-paneled interior, and accommodations including library, messroom, deck lounge & bar, and even a ship's hospital. Your food is prepared by Europa's professional galley staff, and include three delicious meals per day, warm snacks, and coffee & tea. As Europa's Captain likes to say, "She is powered by canvas and cooperation." No previous sailing experience is required. 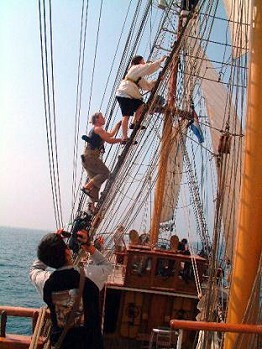 Your professional crew will teach you square-rigged seamanship. You will learn steering, watch standing, navigation & sail handling, and actually sail Europa yourself. This is a true bluewater adventure, both challenging and rewarding, an experience you will never forget, a once-in-a-lifetime opportunity to become a crew member on a traditional sailing ship. You will sail to some of the most remote areas of the world, observe rare marine life, view historic sites and learn the cultures of the peoples you visit. Your shipmates will be from many countries and of all ages. Come roam the seas of the world aboard Europa.